112 page Hard Cover artbook of rare and never before seen production work from Brendan McCarthy, Mainframe Entertainment, and Studio B. Featuring a brand new cover by Brendan McCarthy. Produced by Beach Creative Studios. Art by Brendan McCarthy and more. Pin-Ups from Jim Su (Crozonia), Rob Ruffolo (Transfomers), and more. 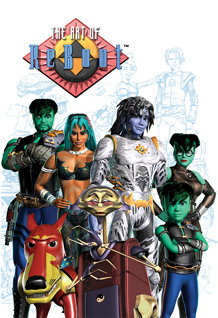 ReBoot is TM & © Rainmaker Animation. All Rights Reserved. 104 page Hard Cover artbook of rare and never before seen production work from Brendan McCarthy, Mainframe Entertainment, and Studio B. 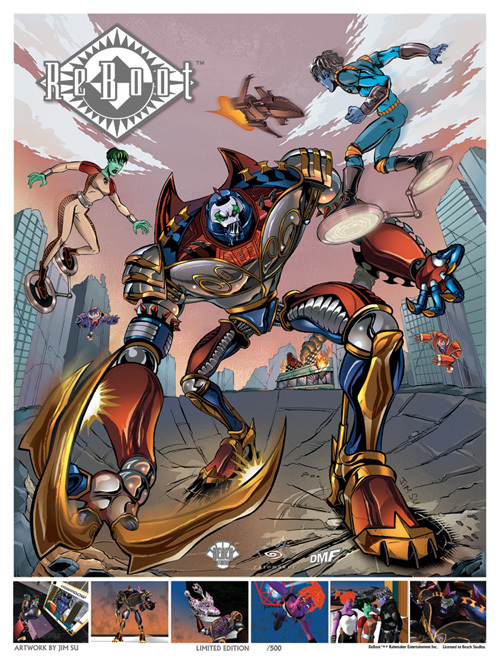 Produced by Beach Creative Studios, DMF Comics, and Arcana Studio. Art by Brendan McCarthy and more. 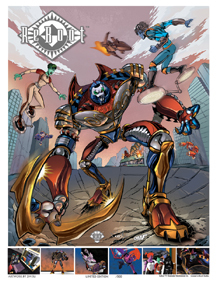 Pin-Ups from Jim Su (Crozonia), Rob Ruffolo (Transfomers), Craig Yeung (Runaways) and more. INTERNATIONAL ORDERS ARE NOW ACCEPTED! 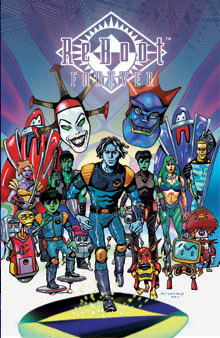 ReBoot and Mainframe Entertainment is TM & © Rainmaker Animation. All Rights Reserved. OFFICIAL LICENSED REBOOT GIGABYTE POSTER! 18" x 24" Signed and numbered. BECAUSE OF PACKAGING, PLEASE ORDER POSTERS SEPARATE FROM BOOKS. ALL POSTER/BOOK COMBINATION ORDERS WILL BE CANCELLED. You do NOT need a PayPal account to purchase through Pay Pal. All major credit cards are accepted through PayPal. $5 US flat rate shipping for orders up to $9.99. $7 US flat rate shipping for orders $10.00 - $14.99. $8 US flat rate shipping for orders $15.00 - $23.99. $10 US flat rate shipping for orders $24.00 and up.